There are many tips that can help you keep up good oral hygiene habits. In addition to brushing and flossing your teeth daily, you can consider using an antimicrobial mouth rinse to help reduce plaque between your teeth. To remove food particles from your teeth, you might try and oral irrigator. An oral irrigator is a device that aims a stream of water at your teeth. Resist the temptation to use tooth picks or objects to pick food out of your teeth because this could damage your gums. Also, keep in mind that the oral irrigator does not replace daily brushing and flossing because this does not remove plaque. 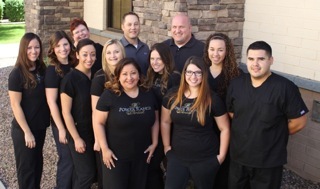 If you would like to know some more oral health care tips, you can give Power Ranch Dental a call at (480) 988- 2282. Thanks!